Many cultivated plants can trace their 'roots' to common roadside wildflowers and gardeners often assume that the wild or native form is simply an escapee from someone's garden. They are only here for a little while and then disappear until the next spring. Plants that do this are called ephemerals and the Virginia Bluebell, Mertensia virginicais a lovely example. These delicate little wildflowers grace us with their nodding, sky blue blossoms each spring and their presence lets us know that winter is finally over. 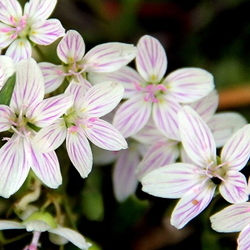 This North American wildflower is native east of the Rockies, from upper Canada to the Gulf Coast. It thrives in any shady, moist, woodland environment and is happy in the same conditions that hostas, astilbes and ferns enjoy. Ephemeral plants normally emerge in early spring, produce their blooms and then die back until the next season. Gardeners who are considering growing them should interplant bluebells with perennials that are slower to emerge, so their new foliage will mask them as they die back. Even though their show only lasts a few weeks, it is such a fantastic display that those of us with a woodland garden should consider planting some. Once they settle in, they happily increase, forming beautiful clumps and vast swaths of that elusive sky-blue color that is so hard to come by in flowers. The flowering stalks stand between 18" and 24" tall (45cm to 61cm) with clusters of blooms that start out as pink buds, but change to a striking sky-blue when open.The leaves even have a bluish tint to them and they are wonderful when paired with other understory plants. Since they bloom well before the hardwood trees develop full foliage, they can be happy in areas where the sun is more intense as the season progresses. Here in west Kentucky, they bloom about the same time as our dogwoods, so are often used with them in our gardens. These plants were well-known by the native peoples and were included in their herbal pharmacy. 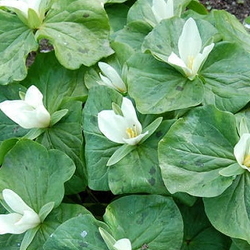 The leaves, flowers and roots were used as tea to treat ailments such as whooping cough and tuberculosis. They even used it as a cure for venereal diseases. However, there is no scientific basis for any of these treatments and the plant has no medicinal value. It isn't toxic and tea was even used to promote good health, much like a modern-day vitamin does now. When consuming any wild plant or food, do let your doctor know what you have in mind as many modern medicines could react adversely with new treatments. While Mertensia virginica tends to spread well where conditions are right, its native habitat is being destroyed by urbanization and farming. Those shady creek banks in the country are being bulldozed over and turned into housing developments. Farmers trying to work every available patch of ground in their acreage are felling wooded areas to plant more crops. This has prompted the USDA to list it as threatened or endangered in several states. Uninformed people have also harvested these plants from the wild in hopes of getting some free plants. 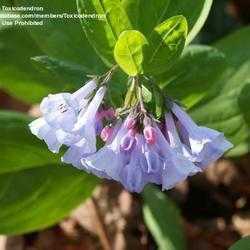 However, Virginia Bluebells do not transplant well and most of the ones taken from the wild tend to perish when transplanted. My images are from a local streambank and while I'm tempted to move some, I know that they wouldn't be happy in my garden conditions. I content myself with visiting the lovely blue flowers each spring and enjoying them in their natural home. The tractors till closer and closer to their bank each spring and I fear that this pretty display will soon be wiped out, however, I know they won't work in my garden either. There are many native plant nurseries propagate Mertensia virginica responsibly and gardeners have several mail order choices where they can purchase plants with a good conscience. Virginia bluebells also provide an early source of pollen and nectar for our fragile pollinator population. When honeybees venture out in early spring, they rely on many wild plants for that first bit of nourishment. With urbanization and agricultural expansion, there are fewer and fewer sources of food they can turn to, so it is always best to leave a bit of the wild on your property if you are a farmer. Several local farmers are now leaving a 'wild belt between their fields to encourage the pollinators. Also hummingbirds use the nectar on their northward migration and they are a host plant for a number of sphinx moths. Our world-wide native populations of wildflowers are ever-threatened. No matter where you live on this earth, there are fragile and beautiful plants clinging to existence in undeveloped areas. We should all educate ourselves about our wild neighbors. If we have favorable conditions in our gardens, we should cultivate a few local rarities. Never harvest plants form the wild unless they are threatened by construction, and only then if you have permission from the property owner. The more of us that educate ourselves and our neighbors, gives these beauties a fighting chance at survival.